Macpac and Nivea are counting down the days to Christmas with a distinctive Advent calendar. 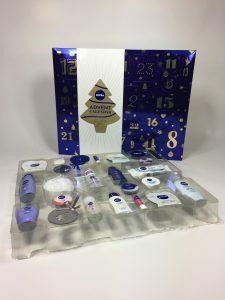 UK Thermoforming designer and manufacturer, Macpac, has designed and produced Advent calendar trays for Beiersdorf Nivea. The trays accommodate 24 different products behind numbered ‘doors’ for each day in the run up to Christmas. 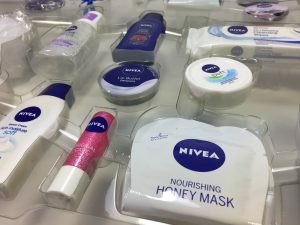 Macpac has closely collaborated with Beiersdorf in this latest project. Behind the Advent ‘doors’ lies the ingenuity – 24 variably-sized and irregularly shaped products securely held into place to ensure stability during transportation, storage and shelf display. Careful consideration towards the environment resulted in the manufacture of a low gauge, lightweight recycled PET (r-PET) with 90% recyclate in the blend, yet still confidently satisfying challenging logistical and modern packing environments without compromising on functionality and product integrity. The Christmas period sees a large volume of packaging destined for landfill. 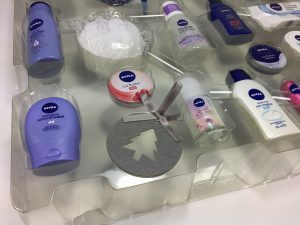 The Nivea tray is 100% recyclable and should avoid this major issue as all Local Authorities can collect and re-process for continual uses. 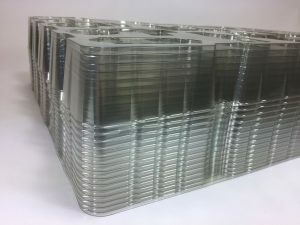 However, if the tray does miss the recycle loop Macpac can now offer a new material in Breakdown PET which, like r-PET is 100% recyclable. However, if it does end up in landfill (end of life) Breakdown PET will biodegrade .